Shown above: 2 Reaction Sofas, 1 large Reaction Coffee Table, and 1 small Reaction Coffee Table. 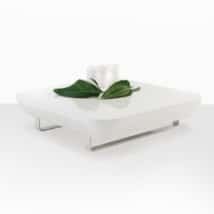 The Reaction Outdoor Furniture collection is ultra modern and ultra-clean in architecture and design. The pure white color and the clean flat lines make it a statement in design and a beautiful contemporary touch to any space. It is clean, flat and smooth, made from a combination of high-tech materials including gel-coated fiberglass, powder-coated aluminum and a striking Sunbrella® fabric; all made for outdoor use. 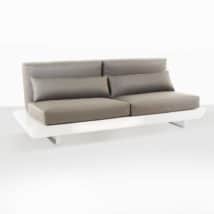 The color palette of this outdoor furniture collection and the low, flat angles are brilliant modern touches on a piece that is sophisticated, and yet subtle. This gorgeous outdoor furniture collection includes a sofa and two complementary coffee tables, with different stances and sizes; all produced in glossy bright white. Stable, beautiful and stylish, this collection is fast becoming a favorite among customers. Sunbrella® Cushions are included with each piece as shown.